So here's my last card for the Verve challenges a few weeks ago. I combined the sketch with Jackie's challenge to add stitching. lovely, Becky, really lovely! those colors are fab! Very cute. I love the three circle panels and the colors are great! Your "stitching" is fabulous Becky. Great card. Love it Becky! The colors, the snowflakes, it all came together so well. Look at you and all of that lovely stitching!! Made you do it....Made you do it!! Great card, Becky!!! ooh, awesome!! 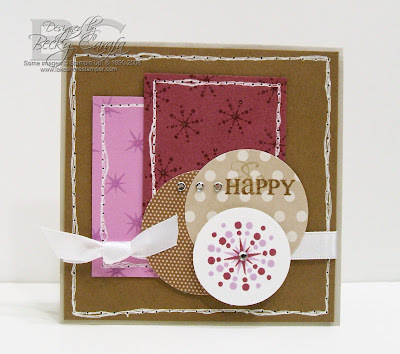 Fantastic colors and love those circles overlapping and with the brads! Fabulous! Beautiful! I love the circles!